Why does the crime rate soar among second-generation immigrants compared with their foreign-born peers? Until recently, most sociologists have explained this increase by noting that many second-generation immigrants feel caught between two conflicting worlds—the old world of their parents and the new world of their birth. But recently researchers have posited an alternate theory: Second-generation immigrants are just “catching up” with the rest of us, claims Bianca E. Bersani, a sociologist at the University of Massachusetts-Boston. Call it the dark side of assimilation. These second-generation immigrants have become as susceptible to temptation and harmful influences as are other Americans according to Bersani. The unhappy consequence is a similar likelihood of committing a crime, Bersani wrote in an article published online by the journal Crime & Delinquency. Other studies have documented how second-generation immigrants have become more like the typical American, both in positive and negative ways. For example, a Pew Research Center analysis of Census data earlier this year found that median family income of second-generation immigrants is virtually identical to the national median and higher than their foreign-born counterparts. Home ownership rates follow a similar trajectory. In her study, Bersani analyzed crime data collected from first- and second-generation immigrants. She then compared those crime rates with the other native-born adults and found striking similarities between second-generation immigrants and native-born non-Hispanic whites. She begins her analysis by noting this well-documented phenomenon: The crime rate among first-generation immigrants—those who came to this country from somewhere else—is significantly lower than the overall crime rate and that of the second generation. It’s even lower for those in their teens and early 20s, the age range when criminal involvement peaks. But just a generation later, the crime rate soars. In fact, it is virtually identical to the rate among native-born Americans across the most crime-prone years. 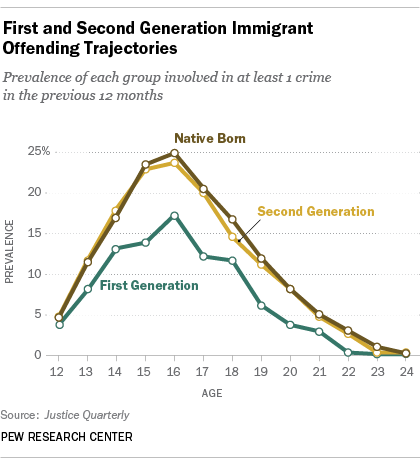 As the accompanying chart taken from an earlier Bersani study shows, about a quarter of 16-year-old native-born and second-generation immigrants have committed a crime in the past year. In contrast, about 17% of the foreign-born 16-year olds have broken the law. Some researchers say the generations face two different sets of experiences, with the second generation—those with at least one parent who was born abroad—caught in the middle. They argue the second generation is caught between conflicting family and social values and expectations, and one result of this old world/new world conflict is a greater propensity to commit crime. For more details, see this 1992 study. To explore the causes of crime among second-generation immigrants, Besani used data from the Bureau of Labor Statistics National Longitudinal Survey of Youth 1997, a household-based, representative sample of people living in the U.S. in 1997 who were born from 1980 through 1984. The initial sample includes 8,984 youth who have been interviewed on an annual basis beginning in 1997. The dataset she used contained data collected through 2005. The survey questioned respondents on sensitive topics, including the number of times they had a purposely damaged or destroyed property, committed a theft, sold or helped to sell drugs, attacked someone with the intent of hurting them or got into a serious fight in the past year. In addition to crime data, the survey included information on important risk factors that researchers say are closely correlated with criminal involvement. They included whether the respondent had been a victim of a crime as a youth, various measures of family attachment as well as performance and attachment to school, whether the respondent had delinquent peers, lived in a neighborhood with gangs, or whether any of the respondent’s peers were gang members. This similar offending “profile” is strong evidence, she argues, that the generation crime gap among immigrants is due to the second-generation behaving like their native-born peers and not only as a consequence of growing up in two colliding worlds.